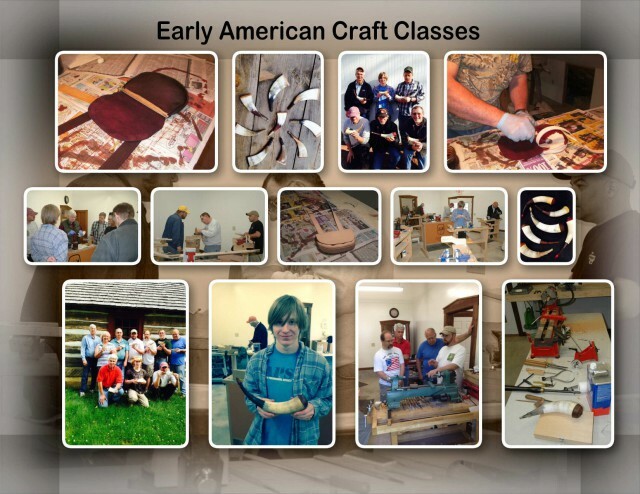 Early American Craft Education at Boulton. The Craft Education program began over a decade ago when the Master Gunsmiths of Jacobsburg Historical Society began sharing their knowledge of hand crafting Pennsylvania longrifles. These classes were so popular that plans were developed to increase the class offerings. The program was formalized and expanded in 2009. First added was a class in how to fashion an authentic period powder horn. This program has been sponsored from the beginning by the Honorable Company of Horners. The next logical class was Leatherworking: making a leather hunting bag. Classes in wreath making were also offered for the Christmas season. The expanding program needed more space and a fundraising campaign was conducted, raising over $50,000 towards renovating an existing barn space into the new Craft Education Workshop. In 2012, classes were added in redware pottery and eighteenth-century clothing construction. The EACE program preserves and teaches the art and industry of early America while also providing a revenue source for the Society, thus building for long term stability. New ideas for classes and additional instructors welcome. Click here to view and print the Early American Craft Class registration form. Click here to view and print the Build a Pennsylvania Longrifle-Gunsmith Apprentice registration form.